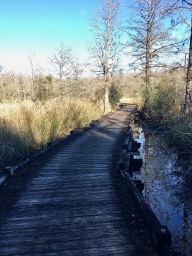 The Osprey Loop consists of wooden boardwalk over creek and marsh land. It can be done with strollers if you choose to enter from the trail head near the Stony Landing house and then turn around and return the same way once you reach the interpretive center (due to stairs) or you can carry a stroller up the stairs into the interpretive center. Use caution when wet however because the boardwalk sections become quite slick and there are multiple sections with inclines to negotiate. It is often recommended to avoid the boardwalk sections when wet, especially with strollers, due to the potential for slipping. The beginning of the boardwalk gives great views of both the Cooper River and Biggin Creek. Turtles, birds and other small wild life can often be viewed from this trail. 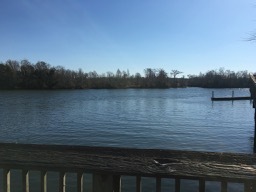 It is a short .25 mile section which can be a great option for getting a short hike in with young children and it can easily be extended by connecting with the additional trail options at Old Santee Canal Park. There are open boardwalks over water however so a hiking harness or back pack style leash can provide peace of mind with young walkers. 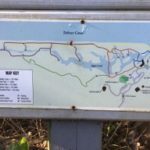 The trail can either begin or end at the interpretive center, which has a variety of exhibits for the whole family as long as providing restrooms and a small gift shop with snacks. Also, since this section of trail is not heavily wooded, it is easier to hike in the summer than some of the other more wooded trails. Old Santee Canal park is easy to locate using navigation services and popular internet maps.